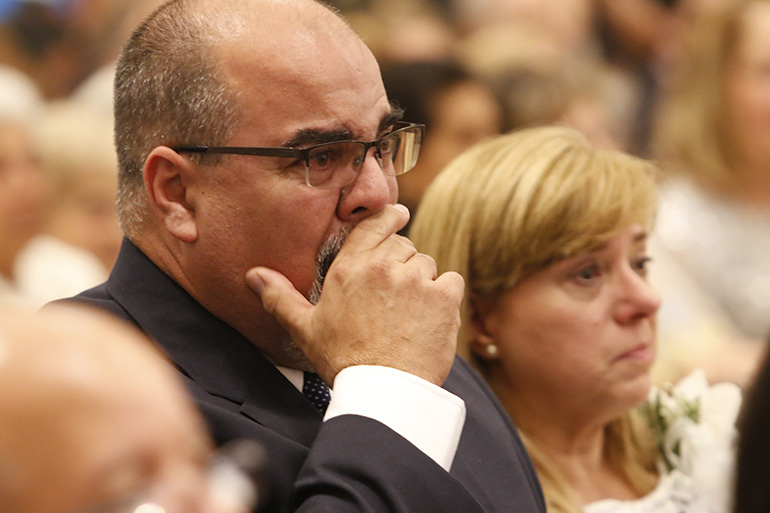 Fernando Gomez tries to control his emotions as he witnesses the ordination of his son, Father Matthew Gomez. Next to him is his also teary-eyed wife, Laura Gomez. An emotional Father Omar Ayubi wipes away tears after Archbishop Thomas Wenski laid hands on him, ordaining him "a priest forever." 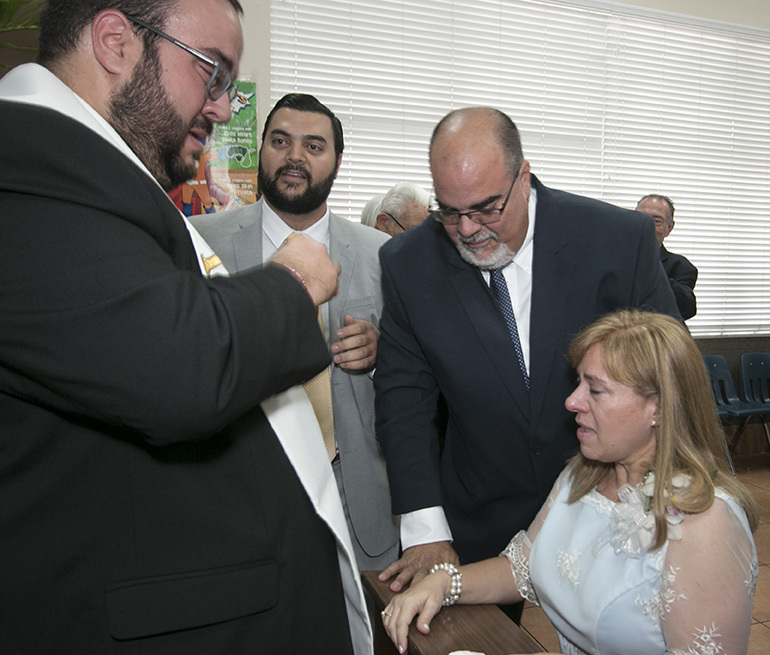 MIAMI | Awash in tears: That’s how Father Matthew Gomez’s parents spent most of his ordination ceremony. Ditto for one of his brothers, Mark. “Tell me the truth. He cried more,” said Laura Gomez after the Mass May 12, referring to her husband, Fernando. “I’m a crier so I know how to control myself,” she explained. Her husband and son, on the other hand, are not as adept. Neither is her son the priest. Asked afterward about the most emotional moment of the ceremony, he replied the Litany of Supplication, also known as Litany of the Saints — when the soon-to-be priests lie face down on the sanctuary as the congregation chants “Pray for us” while listing myriad saints. 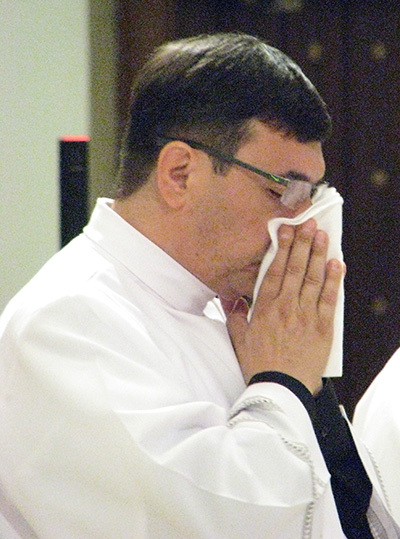 Another ordinandi who had to wipe away tears was Father Omar Ayubi, just after the imposition of hands, the point in the ceremony when Archbishop Thomas Wenski, in total silence, calls down the Holy Spirit — the actual moment of ordination. “As soon as I stood up, when the archbishop did it, he was crying. He was very emotional, and he made me emotional,” Father Ayubi said. Father Gustavo Barros’ mother said she also became emotional during the imposition of hands, and while taking up the offertory gifts. “It’s such a great blessing,” said Gloria Goenaga de Barros. Father Gomez said he had to contain his emotion again during the consecration, when the newly ordained join the archbishop at the altar for the first time. “Okay, this is not practice. This is real life. This is actually Jesus,” he remembers thinking. “I don’t know how I’m going to get through this tomorrow,” he added, when he celebrates his first Mass. At the cathedral hall after the ceremony, Father Matthew Gomez wipes away tears after giving one of his first blessings to his parents, Fernando and Laura Gomez, as his brother Mark looks on.